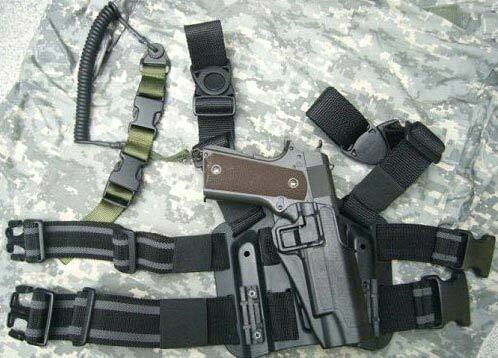 We manufacture, supply and export Thumb Break Holster (Pistol M1911) which is used to carry Glock pistol m1911. The Thumb Break Holster (Pistol M1911) is tactical riot police gear thigh thumb break holster which can be fixed to the waist belt with laces made of strong rubber material which guarantees non-erosion during abrasion. The Thumb Break Holster (Pistol M1911) has adaptable length to height of the user and guarantees ultimate fixation without blocking the pockets. The pistol is protected by a lock as soon as it is placed in the Thumb Break Holster (Pistol M1911). The Thumb Break Holster (Pistol M1911) is lightweight and of premium quality.